Cells have remarkable adaptation capabilities. They can precisely adjust which segments of the genome are copied for use in the cell. They can edit and regulate those DNA copies according to their needs. And they can even modify the DNA itself, such as with adaptive mutations, to accommodate environmental pressures. And in addition to these examples, cells can create completely new, de novo, genes in an evolutionary instant. It is yet another biological capability that reveals the scientific weakness of evolutionary theory. One apparent de novo gene is T-urf13 which was found in certain varieties of corn. T-urf13 is not in the main genome in the cell’s nucleus, but rather in the smaller genome in the mitochondria. The mitochondria is the cell’s power plant which produces adenosine triphosphate (ATP) molecules—the standard unit of chemical energy. Like a dam that is full of water, mitochondria are filled with protons. And just as water flowing through the dam turns a turbine to produce electricity, protons flowing through a mitochondrial membrane turn a molecular turbine to produce chemical energy in the form of ATP. 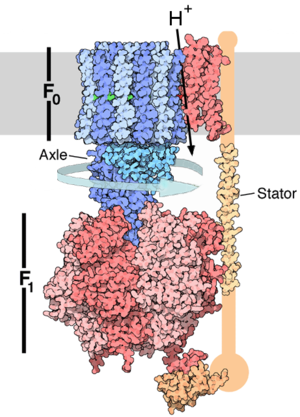 This molecular turbine, known at ATP synthase, is one of many types of transmembrane proteins—proteins that are imbedded in and span a membrane wall. The T-urf13 gene produces another transmembrane protein—URF13. Multiple copies of URF13 group together to provide a channel opening in the membrane for water-loving molecules to cross. The URF13 channel is normally closed and opens only when certain molecules bind to the exterior side of the channel. (Yes, this is a complicated design.) The binding molecule serves to alter the URF13 structure so as to open the channel in just the right way. Unfortunately toxins from certain fungal pathogens also bind and open the URF13 channel. This wreaks havoc because it is like poking a hole in a dam. This problem arose about forty years ago and since then we have learned much about the T-urf13 gene. It is found in only one corn line and appears to have arisen rapidly. A small part of the gene (about 15%) is highly similar to a small part of a different gene in the same mitochondrial genome. That other gene codes not for a protein, but rather for a ribosomal RNA. Most of the remainder of the T-urf13 gene is quite similar to a flanking sequence, just outside of that same ribosomal RNA gene. Finally, there is a small segment of the T-urf13 gene that has no matches elsewhere in the mitochondrial genome. It appears that T-urf13 is a de novo gene, having been constructed mostly from two segments in or around a ribosomal RNA gene. It is intriguing that segments associated with an RNA gene would combine to form a protein-coding gene. It is another sign of the fascinating re-use and mixing and matching capabilities that seem to be built into the cell’s design. Evolutionists, who see biology as a big fluke, don’t see it that way. They amazingly conclude that the T-urf13 gene, which produces such an incredibly complex protein, arose by random chance. Their idea is that spontaneous genomic rearrangements blindly produce new segments of protein-coding DNA on a regular basis. And once in awhile even a blind process finds a marvel like T-urf13. Does this not suggest that the vast genome is a source of de novo genes? Evolution created genomes consisting of billions of nucleotides, and those DNA segments then become sources of future genes, so their thinking goes. There’s only one problem: the idea makes little scientific sense. Even a random DNA sequence the length of the entire corn genome does not contain a single gene that likely would code for a functioning gene. One study, for instance, found that more than a million million random sequences were needed to find a single functioning protein. In that study, not only was the protein shorter than URF13 (URF13 is 50% longer and the chances likely degrade rapidly with length), but what qualified as “function” was quite modest (mild ATP binding was defined as function which, compared to the URF13 channel, is like a tricycle compared to a jetliner). We may not be able to compute precisely the probability of evolution’s explanation for de novo genes such as T-urf13, but we do know the chances are not very good. And that is being kind. Religion drives science and it matters. I'm not sure I understand your point, Joe. Could you re-state it in plain terms? Is it accurate to say that micro-evolution is more a result of "artificial intelligence" within the DNA to adapt or does random mutation play a bigger role as evolutionists say? 1- the protein isn't "an incredibly complex protein"
Keefe and Szostak found more than one ATP-binding peptide in their study. Also, the "probability" of finding a functional peptide or nucleic acid in a population of random oligomers is largely independent of oligomer size. This is something we know from direct experimental observation. You may want to huddle up with Kirk Durston about this - I had the chance to discuss this with him in some detail on the old ISCID boards. "Keefe and Szostak found more than one ATP-binding peptide in their study." Yes, 4. So what's your point? They needed more than a million million sequences per "functional" sequence. "Also, the 'probability' of finding a functional peptide or nucleic acid in a population of random oligomers is largely independent of oligomer size. This is something we know from direct experimental observation. You may want to huddle up with Kirk Durston about this - I had the chance to discuss this with him in some detail on the old ISCID boards." OK, thanks. In any case, not a real big deal in this probability calculation. 800 million tonnes per year. 8e14 grams of corn per year. 8.88e12 ears of corn per year. 4.44e12 corn plants per year. 1e12 random sequences per functioning protein. Of course, each corn plant _isn't_, strictly speaking, a random mix, but corn is known for rapid mutation and genetic mixing (which is how it evolved from teosinte). My point is that the number that looks large from our limited view as human beings (a million million) is actually a reasonable size, even small, to nature. 1.5e9 base pairs per plant. 7.5e8 base pairs of random variation per plant. 3.33e21 base pairs of random variation per year. 3.33e9 functional corn proteins per year. Of course, most of those proteins don't have any function; they'd just get made, do nothing and go away. But with over 3 billion proteins floating around in the corn biomass, is it that surprising corn found something useful that one time? And, I just remembered that this protein was found in the corn's mitochondria! We'd have to increase these numbers by a factor of at least two or three (probably more, considering the number of mitochondria in the corn plant), since each mitochondria reproduces separately and is prone to its own mutations in it own DNA (and we'd have to include the corns chloroplasts as well, since they're also individuals). What was the point of this posting again? De Novo Genes: What are the Chances?